Do you really want to attend a course with Ministry of Upholstery but you can’t get to our Manchester workshop? Now you can receive the same professional level of tuition right in your own home. Brought to you from the UK’s leading modern upholstery school and delivered by TV upholstery expert Anthony Devine. 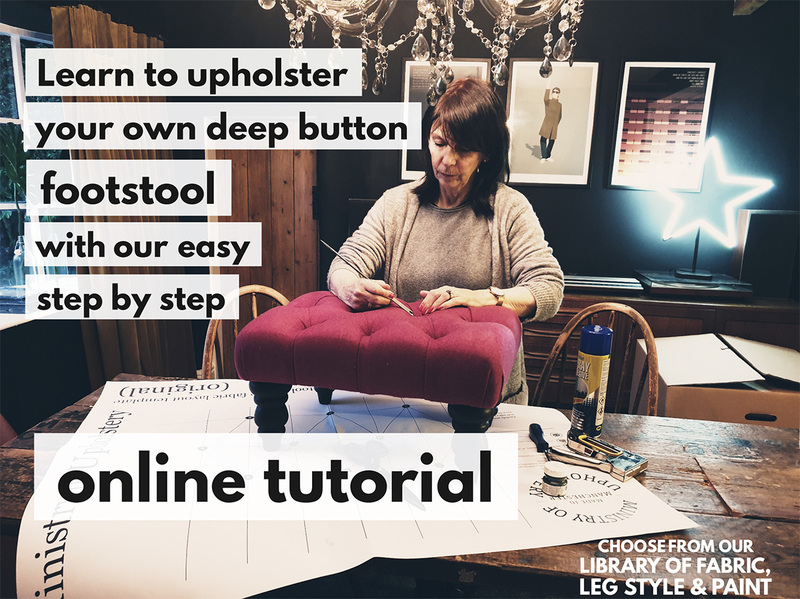 We have carefully developed this course to be accessible to everyone; whether you have never tried upholstery before or have some basic skills and wish to learn more. From a kitchen table to a spare room, shed or garage, you don’t need any specialist equipment, just a few basic tools and all the materials are included in the price. Unlike most online videos and tutorials available, our course is clear, concise, professional and most importantly, very easy to follow. FREE Ministry of Upholstery tote bag with every order! The first course we are bringing to you is the deep buttoned footstool. Have a look at the video on this page, make sure you turn the sound up and our Creative Director Anthony Devine will explain the process to you. It’s simple, you buy the course online by clicking ‘Let’s get going’ at the bottom. You will be asked to personalise your course, by selecting from two sizes, five leg choices, a range of paint or wax and 15 different fabric options. Once your order has been placed your Footstool Kit will be sent in the post. When you place your order you’ll be asked whether you wish to purchase any of the ‘tools of the trade’ that you may require. We can include these in your order, but of course if you already have these, then that’s great. You will now be able to view the online course through the website, which you can view anytime from any device. The tutorial is broken down into easy to follow sections and packed full of useful hints and tips. That’s it. When you’re ready you log on and follow the step-by-step guidance until your footstool is complete. Then you put your feet up and enjoy and well-earned brew! If you want to make more stools, you can buy more kits anytime.